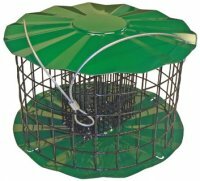 I just purchased this suet feeder today at a local retail store and filled it with peanut butter suet. Bluebirds were inside eating right away and it really did keep the starlings out. Will purchase your other products.